I always approach books recommended by friends with some trepidation. On one hand, the recommendation comes from someone who knows me and what I like to read; but on the other hand, what happens if I don't like the book (remembering Wide Sargasso Sea)? 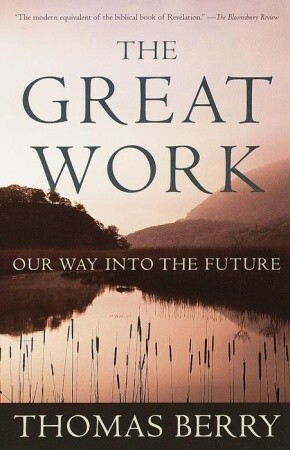 The Great Work is the all-time favourite book of a good friend, and I finally sat down to read it this month. While I liked it, I didn't love it. Berry's main premise is that our current geobiological era is ending, due to the devastation that humans have wrought on the planet; and that the Great Work of our present age is to move from our current way of living (all things are placed on the earth for humans to use) to a more benign way of living, in harmony with everything on the planet. (all things have equal right to exist and be). He explains in the first chapter, "We have human rights. We have rights to the nourishment and shelter we need. We have rights to habitat. But ewe have no rights to deprive other species of their proper habitat. We have no rights to interfere with their migration routes. We have no rights to disturb the basic functioning of the biosystems of the plane." Later, he describes standing by a meadow as a child where he observed, "Whatever preserves and enhances this meadow in the natural cycles of its transformation is good; whatever opposes this medow or negates it is not good." The first part of the book describes the earth's history and emergence of life, with the cycles of seasons and days; with a particular focus on North America. The next part describes what has gone wrong, in human history - the human-centered rather than earth-centered norm; ethical thinking that favours humans over non-humans; corporations that control all aspects of our lives; over-reliance on petroleum; education and political systems that promote the status quo; and an economy that depends on extraction of resources from the earth that by definition must come to an end. And the final part of the book describes what must be done to enter the new era of living in harmony with the earth - re-inventing the human using the wisdoms that we already have but may not recognize (the wisdom of indigenous peoples, the wisdom of women, the wisdom of the classical traditions, and the wisdom of science). I found much of this book to be very bleak - describing how all aspects of life have gone wrong due to human actions. A quote on the cover calls this book "the modern equivalent of the biblical book of Revelation" however I found myself comparing the author to John the Baptist, "the voice of one crying out in the wilderness," calling on all people to repent of our ways. This is a book that I do think that people should read. Our current way of living is unsustainable. Petroleum is going to run out, possibly within our lifetime. Life in the future will, by necessity, look different than life today. I did have a few quibbles with this book though. I found it to be written from a North American (and particularly US) point of view. If our Great Work is to re-invent how we live in relation to our earth, it will necessarily need to involve all people from all cultures. Having lived for a few years in another culture (the Haya people in Tanzania), many of the statements of why life is going off-the-rails don't apply in that culture. And at the same time, I found his solutions to be naively optimistic at times. "We need not simply a national or a global economy but local subsistence economies where the variety of human groups become acquainted with the other species in the local bioregion." He does state that local populations will need to adapt to the local environment; but is this truly feasible? But overall it is a book that made me think and made me consider the way that I am living now. I am the first one to admit that, much as I try to make as small of a footprint on this earth, I am still dependent on petroleum and the extractive economy. Thank you, LM, for the book recommendation! I am going to end with the poem that serves as the dedication to this book, as I think that it is very beautiful and sums up this book very well. Diversity of their regional communities. I'm glad you liked the book; I don't expect you to love it! This was one of the first books I read on eco-theology, so it holds a special place for me :) He is, in this book, somewhat pessimistic. His suggestions are sometimes radically challenging (feasible yes, practical no). It is definitely written to a US audience, some of his other works articulate that it's the US/NA mentality that needs to change first (he did a great article on footprint versus family size based on georegions). I like that this book is very accessible, you don't need to be an eco-geek to understand it (like many others on my shelves...) Alas - anything that gets us thinking is a good thing! LM - I'm glad to hear that he isn't always this pessimistic :-) And it definitely got me thinking, and may even go down as a book that changes the way that I view the world (there are definite signs in that direction...).